Adelaide textile artist Deborah Prior will walk through the city unravelling stitches and then knitting them into a different form to launch her new solo exhibition at Art Pod on Thursday. Fleece is inspired by a research project Prior did at the South Australian Museum, which is where she will begin her performance. The exhibition explores a number of historical and socio-political ideas – from Australia’s early reliance on sheep for economic prosperity, to the lasting impact of colonisation on Indigenous Australians. Fleece is described as a project about string, yarn and sheep. What type of work will you be showing in the exhibition? 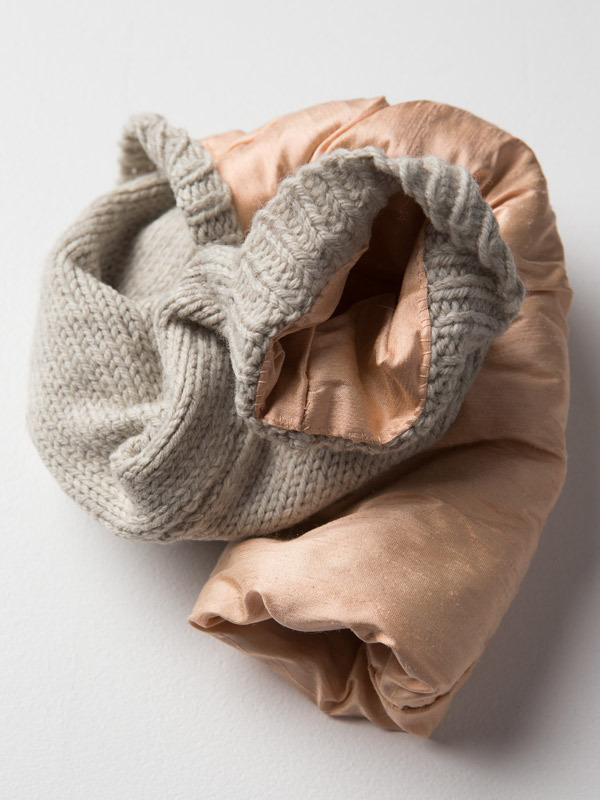 Prior: Fleece is a small collection of sculptures that (unsurprisingly) employ wool in a number of guises: there is knitted woollen yarn, a woven woollen blanket, and a 32-year-old sheep skin. I know it is 32 years old because it was my baby rug! Evidently my parents knew I would grow up to be a sculptor because they saved it all these years. For Fleece, the humble Australian Merino has become emblematic of Australia’s recent and difficult colonial history. My baby rug (or fleece) is significant as it implicates me in this history – I’m not outside of this this story, I’m part of it, too. The exhibition will open with a performance that involves you unravelling your stitches and then knitting them into a different form, with several other such performances planned during the exhibition at Art Pod. What are you seeking to convey through this process? From previous experience. I know that knitting in public always prompts strangers to strike up conversation and share stories with you – usually about their knitting and their families. So my knitting performance is a meditation on stories … all those individual histories out there. Key to this performance is that I am unravelling my yarn and then knitting it into something new – a long, umbilicus-like tube or string that could be suggestive of both family connections, and even broader histories. Attempting to unravel yarn (like histories) is a tricky process – you get tangles and twists and snarls. And un-ravelling/re-knitting colonial histories … well, who knows what surprises you might find! I understand you were inspired by the string collection in the SA Museum’s Aboriginal Cultures Gallery – can you explain more about the genesis of the project? Being an artist who works primarily with textiles, I have a natural predilection for all things “stringy” – yarn, twine and thread – all strings with which you can do, make and explain so many things. In the Australian Aboriginal Cultures Gallery, I was immediately attracted to dozens of expertly spun skeins of string and yarn. They are objects of immense beauty and incredible skill, and I really wanted to highlight them. The thing is, string is complicated: while it might be a universal human apparatus, for many Indigenous Australian communities, string(s) can also be carriers of great cultural and spiritual significance. I felt these were not my stories to explore or share, so I considered my own Anglo-Australian heritage, and the tools and materials of my art practice. Once I began thinking about my knitting yarn and its material origins – from the back of the sheep – and how that might be connected to my research at the Museum, I began to see my story. What are some of the socio-political and historical ideas you are seeking to explore through Fleece? But to fleece someone is also to swindle them. There can be no denying that the past 227 years of European settlement have been disastrous for Australia’s First Nations People. It’s an uncomfortable truth that my own family, like countless other families, has benefited from working the land – growing wheat and raising sheep – on country that didn’t really belong to them. For Fleece, I’ve made a necklace from tiny plastic sheep tokens taken from the classic Australian board game Squatter. From a post-colonial perspective, the notion of squatting invokes some difficult questions about land ownership and the myth of Terra nullius. And Indigenous Australians are still getting fleeced. All this wealth we’ve taken from digging up or farming country, yet currently in Western Australia, communities are being threatened with closure because they aren’t “financially viable”. To me it seems a lot like history repeating … history just being unravelled and stitched up the same way all over again. Fleece opens on Thursday, April 9, when Deborah Prior will begin her unravelling and knitting performance at the SA Museum at 4pm, before walking to Art Pod at 25 Pirie Street. The exhibition, curated by Polly Dance as part of Adelaide City Council’s Emerging Curator program, will continue until June 5, with further performance dates scheduled for April 14, 21 and 28. Details online.